The boys are back in town! Thirsty Thursday returns for Knights season opener. CHARLOTTE, N.C. We are less than FOUR days away from #OpeningKnight here in Charlotte. 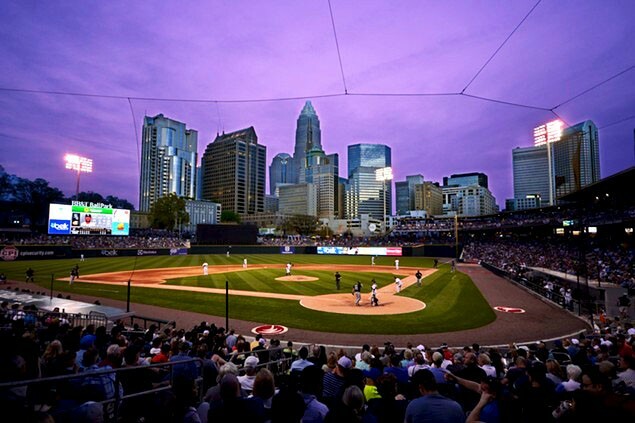 Join the Knights this Thursday, April 4 at BB&T Ballpark when the Knights play host to the Durham Bulls, the Triple-A Tampa Bay Rays, at 7:04 p.m., the first of a four-game opening series. Gates open at 6 p.m. for the home opener. Thirsty Thursday is back for all 12 Thursday home games and will feature $3 domestic drafts, $5 craft drafts and $1 small sodas. - A 2019 magnet game schedule giveaway Thursday through Saturday. - The first Friday Night Fireworks show of the season. - Homer The Dragon's 30th Birthday Celebration, which features a Homer The Dragon bobblehead giveaway to the first 2,000 fans on Sunday. - Post-game Kids Run the Bases on Sunday. Overall, the White Sox have a talented farm system, ranking third among all 30 teams per MLB. Dylan Cease, a right-handed pitcher from Georgia, is one Knights player to keep an eye on this season. Cease is ranked as the 21st overall prospect in baseball and characterized as having one of the best fastball/curveball combinations in the game (per MLB). He has a quick arm, generating 95-98 mph heaters that regularly top into triple-digit territory. His curve has tremendous depth and power, a true obstacle for batters when it's on. Cease is also ranked as the third overall Chicago White Sox Prospect and 5th overall right-handed pitcher in the game per MLB. The Knights are looking to bounce back after a 64-75 2018 campaign. 15-year MLB veteran, Mark Grudzielanek, returns as the teams' manager for his third season with the Knights.